Curious about gravel road riding? Let us help convince you to give it a try with these top 10 reasons to get out and pedal on some gravel. #1 – Mix it up. Add a new dimension to your cycling by taking up another cycling discipline. More different kinds of riding make you a better rider overall, and you’ll bring some novelty to your riding by not always being on the same old paved roads or trails. #2 – Enjoy more roads to ride. Ever notice how many places you can’t get to on paved roads that you could reach via gravel roads? When the pavement ends and turns to gravel, you don’t have to stop riding: keep going! In lesser developed areas with relatively fewer paved roads, you might double, triple or even quadruple your riding options by including gravel roads in your rides. #3 – Enjoy different scenery. Because you’ll be able to go so many more places, you’ll have the opportunity to take in more and different scenery. Just don’t forget to look around as you pedal, or better yet, stop and have a snack and give yourself time to take in the views. #4 – Create your own bikepacking adventure. Why limit yourself to just one day of gravel riding? Dig out your map and go big. Pick out routes to create your own multi-day adventure. With ever increasing options for lightweight and well designed frame and rack bags, there’s no excuse not to load up your camping gear and food and set out for a few days. #5 – Experience more different conditions. Gravel comes in all shapes and sizes. Sometimes a gravel road is so hard-packed that it feels almost like a smooth, paved road. Or it may be super sketchy – covered big and chunky gravel or small, loose, fine gravel. And conditions you encounter on any given gravel road may vary widely from day to day or from season to season as weather conditions change and gravel road maintenance happens (or doesn’t!). #6 – Improve your bike handling skills. The variety of conditions possible during gravel riding will make you a better bike handler. For example, riding loose gravel will help you develop a smoother pedal stroke with more evenly applied power; or riding fast over sketchy, loose conditions will teach you how to maintain control of your bike as you learn to go with the flow when things get unpredictable. #7 – You can ride gravel when it’s wet without damaging your local trails. Mountain bikers need not miss out on riding just because the local trails are too wet or muddy to ride. You can’t hurt a gravel road by riding a bike over it no matter how wet it is. So the next time it’s rainy, give your singletrack a day or two to dry out and firm back up, and head out instead for a spin on some gravel. #8 – Meet new friends. Because gravel roads are typically plenty wide and have scarce traffic, you’ll have more opportunities to ride two-by-two and thus have conversations with other riders. Head out on some local group gravel rides, and you’ll meet some new riding buddies, too. #9 – You can ride gravel on your current bike. 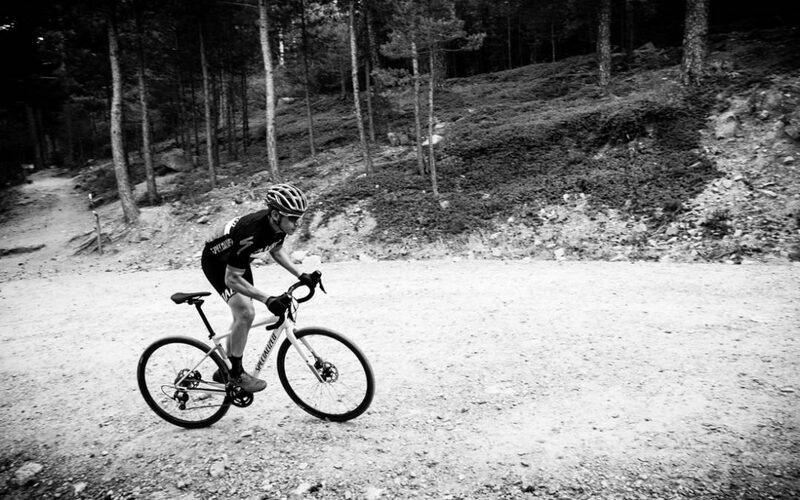 You don’t need to invest in a new bike to ride gravel. Put some slick or less knobby tires on your mountain bike, or put some wider, knobbier tires on your road bike, and get out there and pedal. If you’re on your mountain bike, don’t forget to lock out your suspension on all but the roughest roads so that you can pedal efficiently without wasting energy making your suspension compress and rebound. #10 – It’s an excuse to buy another bike. While you don’t have to buy another bike to enjoy gravel riding, you could use your newfound gravel riding hobby as an excuse to buy a new bike especially designed for the job. Remember the answer to the question about how many bikes you should have? It’s N, where N = n + 1 and n is the number of bikes you currently have!